The entire Bush family is in mourning this week following the death of their patriarch, former President George H.W. Bush. But when a heartbroken Laura Bush stopped by the White House on Tuesday, First Lady Melania Trump knew just how to cheer her up. These two women are pure class. George H.W. Bush, the 41st President of the United States, passed away late on Friday night at the age of 94. He lied in state in the U.S. Capitol until Wednesday morning, when his funeral service was held. Meanwhile, First Lady Melania Trump hosted former First Lady Laura Bush for a special tour of the White House Christmas decorations on Tuesday, and it really seemed to cheer her up during this time of immeasurable grief. “Looking forward to being with the wonderful Bush family at Blair House today,” President Trump announced on Twitter. “The former First Lady will be coming over to the White House this morning to be given a tour of the Christmas decorations by Melania. The elegance & precision of the last two days have been remarkable!” he added. Several of George H.W. Bush’s grandchildren also joined the tour. Afterward, Laura Bush posted on Instagram thanking Melania for her hospitality. The Bush family and the Trumps have certainly had their differences in the past, but this is no time to let petty quarrels stand in the way of remembering and celebrating a great American life. Of course, the maturity that these two families have shown is a marked departure from the decorum of the Obamas, who use every chance they can get to take public jabs at the Trumps. This also could not be more different than what we saw during the funeral arrangements for the late Sen. John McCain over the summer. After seeing how McCain’s funeral went down, the Bush family wanted no part of the anti-Trump circus it devolved into. After John McCain passed away in August, it was revealed that, prior to his death, he had painstakingly planned every detail of his funeral arrangements, up to and including not inviting President Donald Trump to attend the ceremony. This paved the way for his daughter Meghan to deliver a nasty eulogy ripe with anti-Trump sentiments. But that was far from the case at George H.W. Bush’s funeral this week. A source close to the preparations said that Bush “wouldn’t want anyone there to feel uncomfortable, including the incumbent president.” The Bush family even reached out to Trump over the summer to make sure he knew that he was formally invited to attend the funeral of his predecessor when the time came. Avoiding a political smear fest was certainly the classy move in this situation. The nation should be afforded the chance to mourn their former Commander-in-Chief without having to sit through partisan attacks on their current leader. Furthermore, Melania Trump’s gesture to extend the olive branch to Mrs. Bush by inviting her to tour the White House’s lovely Christmas display shows what incredible character our first lady truly has. 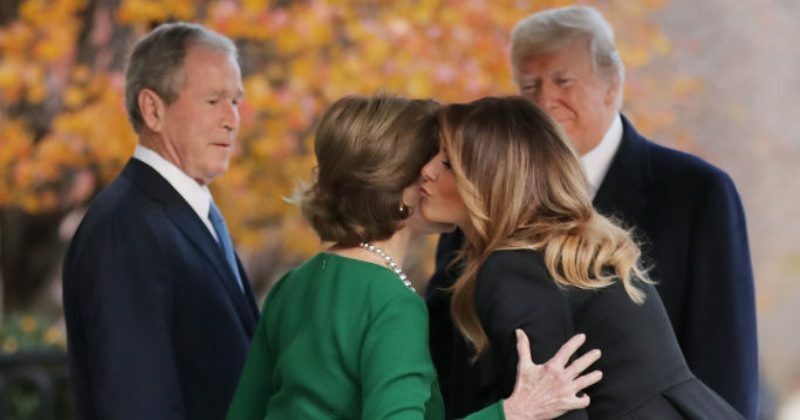 This was surely a welcome diversion for Laura Bush from the sullen events of the week, and judging by the heartfelt thanks she offered Melania on social media, the gesture was much appreciated. Please show these two beautiful and gracious women your support by sharing this story.